I'm always interested to see people trying out espaliered fruit trees, even though I've never quite been intrigued enough to experiment myself. 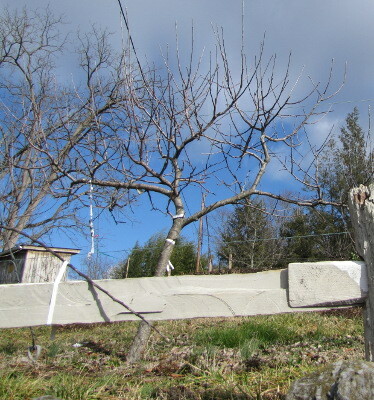 So I was thrilled to notice espaliered apples at Bristol's Urban Homestead when Mark and I swung by last week. The photo at the top of this post is clearly a young apple tree who is just entering the training program, but the tree to the left might be ready to graduate. I wonder if it's bearing yet? 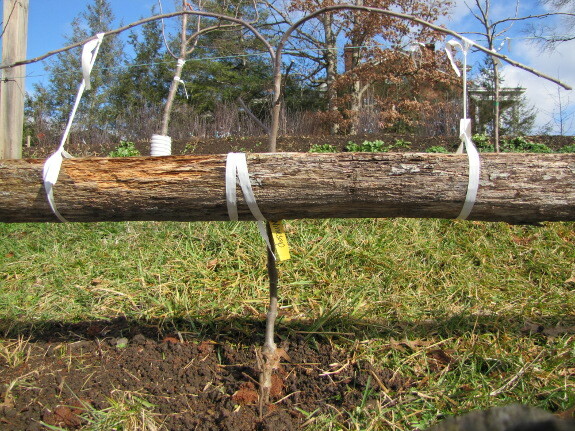 Next time, I'll have to call ahead and see if the owners can tell me more about their espalier experiments. Our chicken waterer keeps your coop so clean, your neighbors can't complain. Wow, thanks for the link back to your original post on Tim Hensley and his Urban Homestead! I have been poring over his site and will likely end up ordering from him if I can find a place to cram a dwarf tree (or maybe an espaliered tree) onto our lot. I recommend them very highly! The two apples I bought from them a year ago took off and grew very well, despite the fact that I've had trouble with apples in the past. Granted, part of that could be the local effect --- he grows varieties that do well in my region, and I picked the trees up and brought then straight home, so they weren't stressed by being mailed. But I also suspect his stock is just high quality in general.